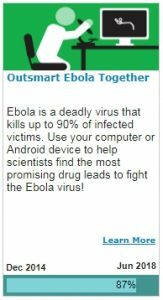 Apparently Outsmart Ebola Together has shown it’s ending date. June 2018. Currently I’m still focusing on Smash Childhood Cancer research. I already provide OET with 1 year and 19 days worth of processing time. Of course, ending date can change due to various reason, but still good to know. Yeah, I know I haven’t been blogging for a while. Life been busy. I have racked 75 days in crunching Smash Childhood Cancer research. Can’t wait to reach Gold badge. 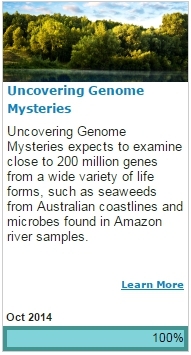 Finally, Uncovering Genome Mysteries have been removed from Research page to Completed Research. It was fun to be a part of it. Started in 2014, finally UGM research crunching at WCG has about to come to an end. Completed work unit returned are less and less by the day as there are less work units to go around. It has been fun crunching UGM work units. Now that I’m not getting any UGM work units as it is nearing completion already, I’m ticking the OpenZIKA project check box. Will keep crunching until early Feb 2017. We’ll see what happens then. Ever since watching Beyond 2000 when I was a kid, browsing through Edmund Scientific catalog, I knew I loves science. But I want to do more than just clicking LIKE. I want to be a part of it. Getting involved. I will wrote more about Citizen Science later. But for now please read more on World Community Grid. There is a WCG button on the left. Now you can do more than just clicking LIKE.